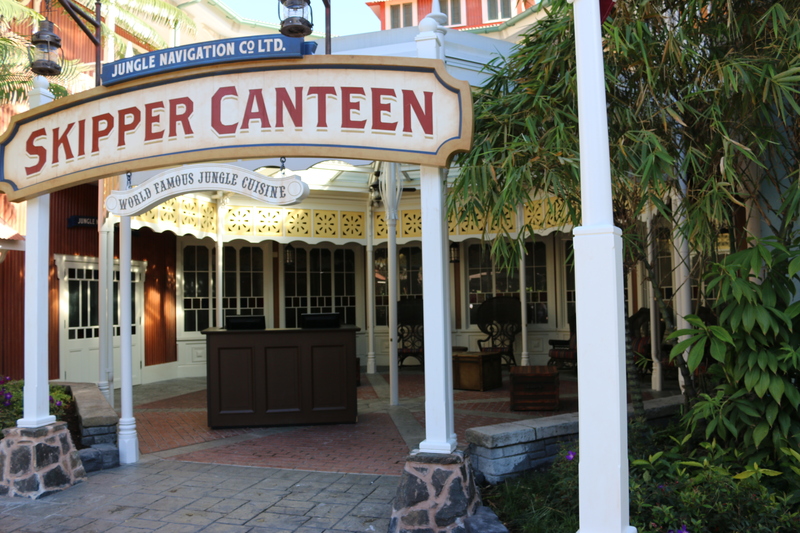 Yes, finally the long-awaited (well maybe not THAT long) but much anticipated Skipper Canteen Review. 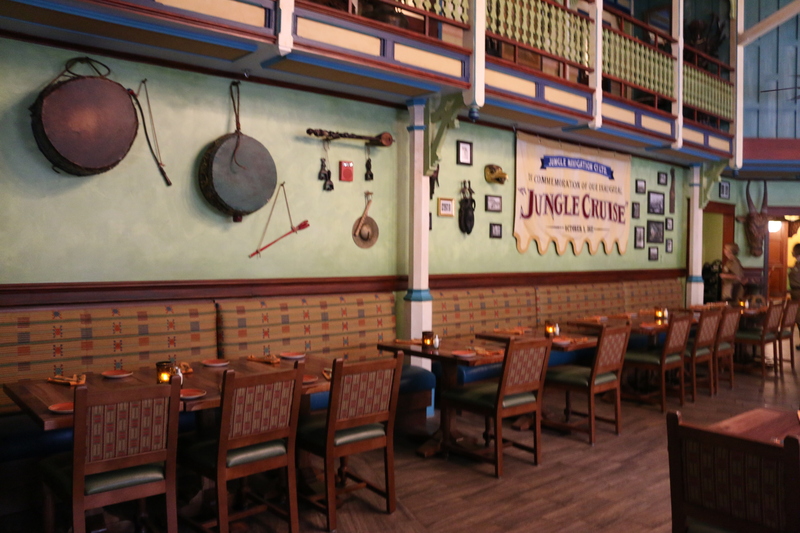 So officially on December 16, 2015, The Jungle Navigation Co. Ltd. Skipper Canteen opened to the masses. I was able to go eat there for lunch on January 29th, along with a few other Dole Whipped ladies. I will start by telling you how excited we were! I love new and Disney and I am always trudging along missing things they take away but almost always blown away by the new stuff. Like Maelstrom, I am grudgingly withholding judgement about the whole Frozen Ride in Norway until I see it because I know Disney blows new stuff out of the theme park. So, this new restaurant I did not have to be sad or miss anything because basically it was an addition and not a replacement. So, all is well. We arrived around 10:35am and they let us go ahead and put our name on the list and instead of handing out pagers they took a cell number and said they would text us when our table was ready, sometime after 11am when they opened. 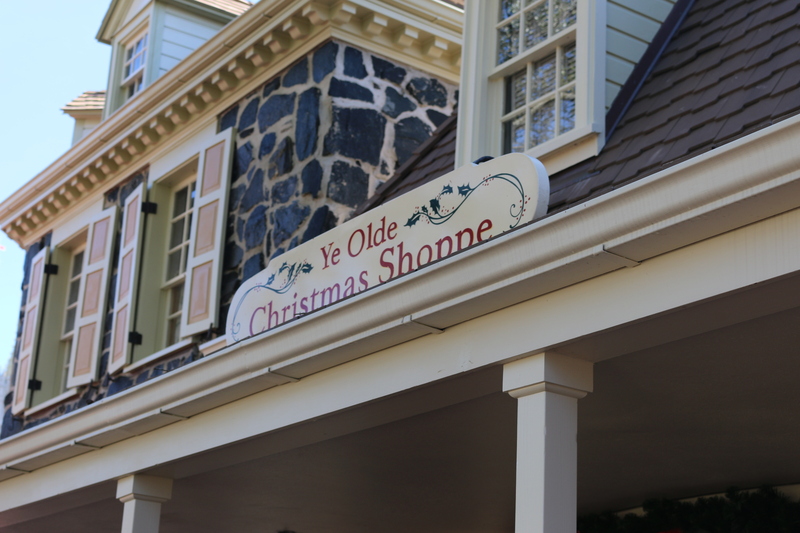 This was easy peasy so we sauntered off to spend our time efficiently so we walked over to the Jungle Cruise ride but the wait was quite long so we kept on walking and managed to find ourselves at the Ye Olde Christmas Shoppe (one of our favorites!) We definitely were able to spend our time shopping. We managed to each buy something for ourselves and right at the moment of payment our text from Skipper Canteen came and off we went! When we were seated they do a mini tour telling us about what each room was and where to find the story of the restaurant (on the back of the menu). We scoured the menu and honestly we found it a bit limiting and a bit pricey for lunch. So, we each ordered appetizers and thought we would also order desserts at the end. 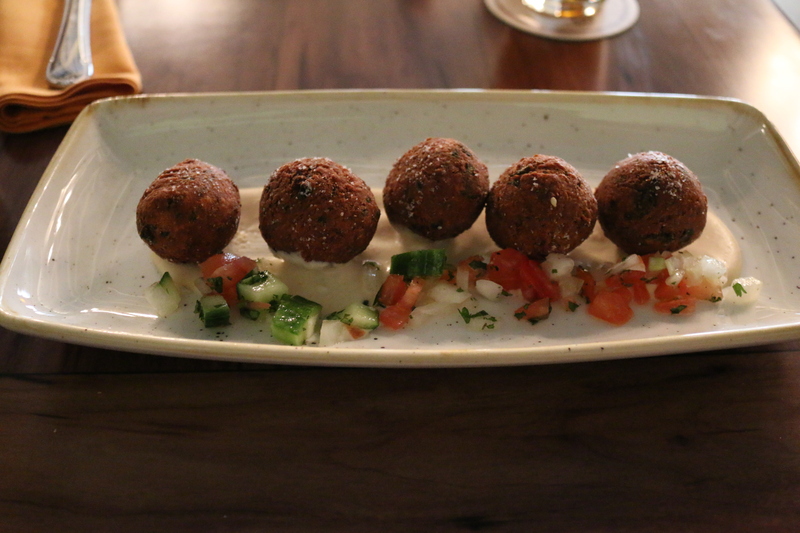 Jamie and I each ordered a Falls Family Falafel and I was excited to try these as I am a BIG falafel fan. 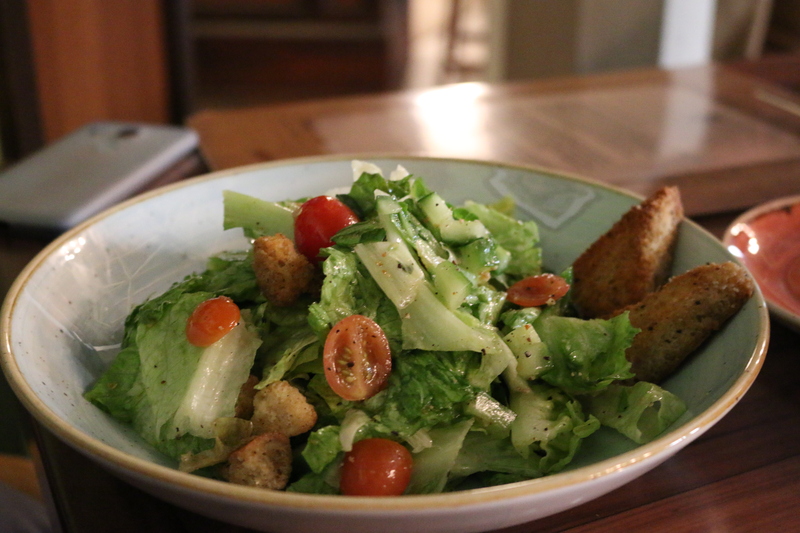 Shannon ordered the Baladi salad which is a classic salad with a Garlic-Coriander Vinaigrette dressing. Before the meal was served they did bring bread and a honey dip. 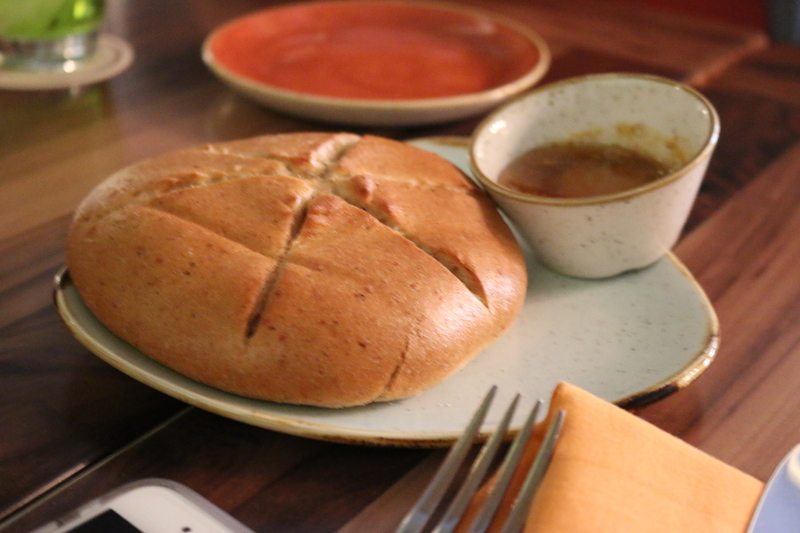 The bread was just a bland wheat bread but was soft and the honey dip was okay but had a bit of saffron (or something similar) that gave it a bit of an odd taste. But, it was definitely edible and we ate it all up! Both Jamie and I were disappointed in the falafels. They were very dry and a bit hard to swallow. The yogurt dressing on them was good and helped some but it was a very light amount of dressing and so I made it about halway (3 out of 6 falafel rounds) before giving up. Shannon’s salad was good and we all tried it. The dressing was good and the perfect amount, though it was garlic heavy so if you do not LOVE garlic or want to kiss a lot after then skip this maybe or bring a toothbrush! But, we did enjoy the salad and thought with steak on top it would be a good meal. After the meal we all were not overwhelmed or very motivated to try the desserts. Because of a birthday celebration amongst us the server brought over a small bonbon (that is not on the menu) and we each had a small bite and gave it a thumbs up. 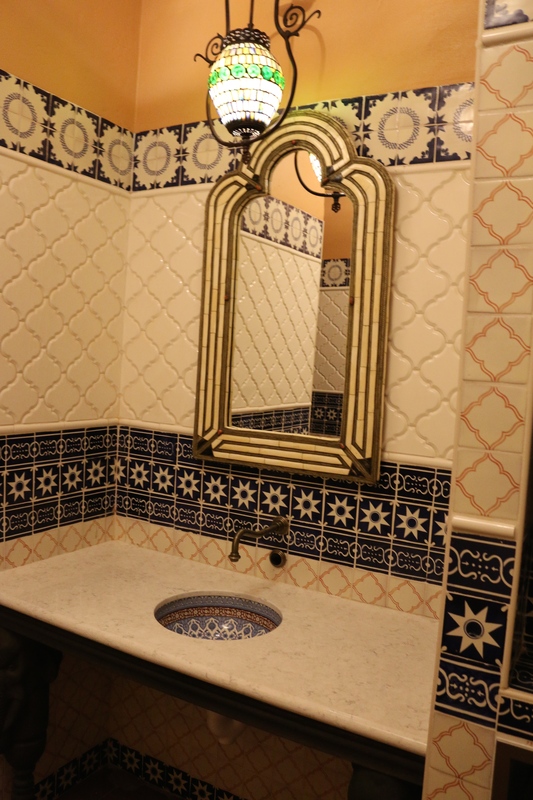 Overall, the decoration was great and as always attention to detail was inspiring. The menu, food and service was a solid C+ and so definitely can use some Disney TLC. 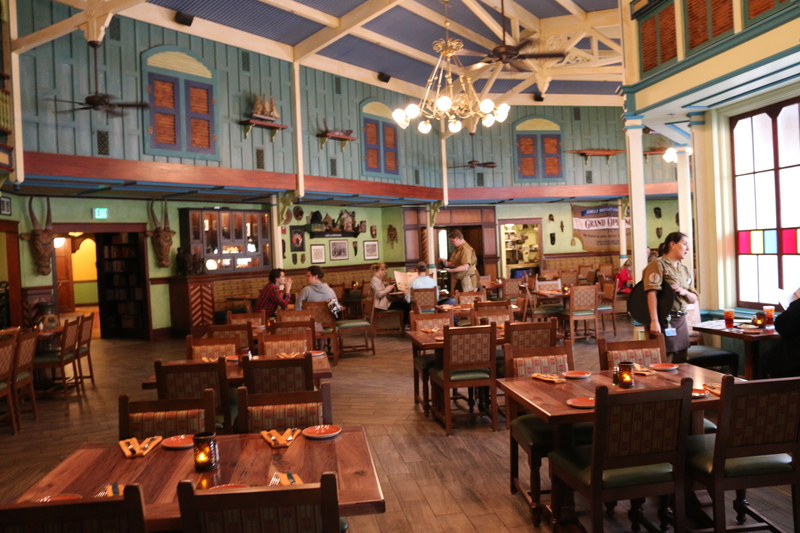 I am sure next time we try Skipper Canteen some kinks will be fixed – if not get the Thai soda and dessert! 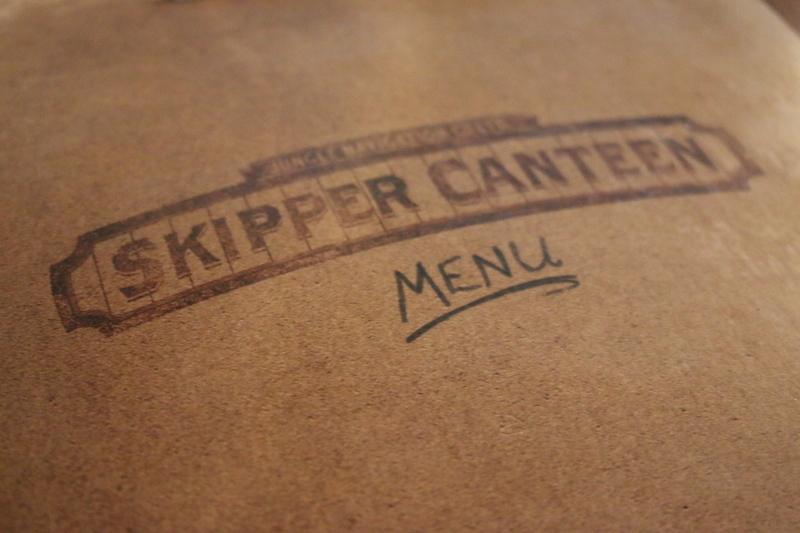 Have you eaten at Skipper Canteen? What did you think?